RALEIGH, N.C. - Jan. 20, 2015 - PRLog -- Robert Brooks, writing under the name R. R. Brooks, has crafted a stunning and an exciting adventure of a young man’s journey of discovery of his gift from the gods, the trials he faces as a young adult, and the future he must fight for—a future that will lead him to his ultimate destiny. Leo Publishing, LLC, is proud to have discovered this very talented author and is proud to release his first novel that is sure to capture the imagination of young-adult fans of this genre. Robert Brooks holds degrees from both The Johns Hopkins University and Princeton University, with a career that spanned several decades working in the pharmaceutical industry; he has authored numerous technical and scientific papers. However, this did not dampen his desire to write exciting fiction literature. Having retired, Brooks, originally a native of New Jersey, now calls North Carolina home. An avid writer, Dr. Brooks had his short stories of adventure and science fiction both acclaimed and published, and his talent as a playwright is evident, one of his plays having been staged. 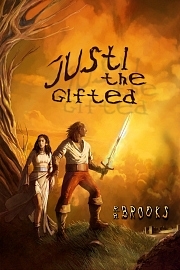 Justi the Gifted is his first full-length novel to be published. It is a compelling adventure tale of a young boy who over time discovers—trying to comprehend—his given great power, but a power that has the potential to control him, a power that can kill should he become consumed by anger against those who would oppose him. Justi the Gifted is also the inner search of this young hero that leads him to find his soul mate, who was chosen to hold a power that completes Justi’s gift. Justi the Gifted is a story of the hero’s journey, and that of young Justi, who will face both obstacles and enemies who seek to destroy him and the one he needs to rescue in order to restore the kingdom.